Following a needs identification research project, Kopernik and WIPO GREEN held a matchmaking event with the aim to foster partnerships in addressing clean technology needs in Indonesia, Cambodia, and the Philippines. On June 4th, WIPO GREEN hosted the matchmaking event at the Asia Clean Energy Forum (ACEF) at Asian Development Bank (ADB) headquarters in Manila, Philippines. This year’s theme focused on “Harnessing Innovation to Power the Future” as ADB promotes the potential of innovation across finance, technology, and policy to accelerate progress. 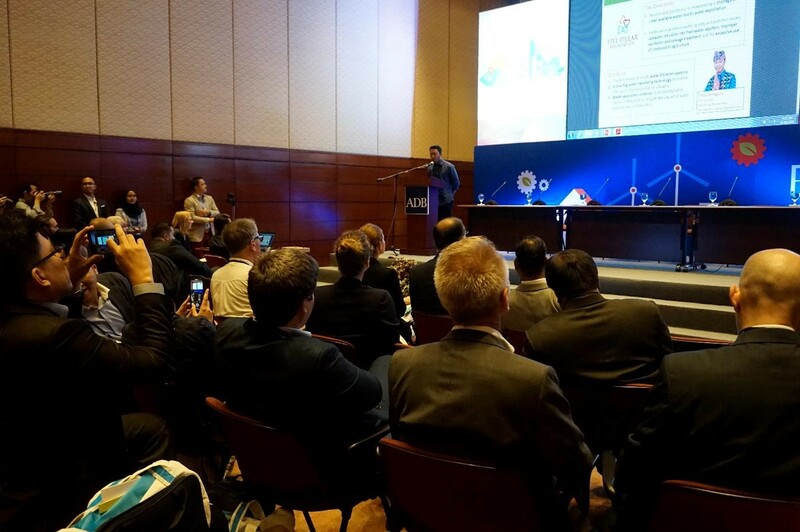 Approximately 1,500 clean technology practitioners from around the world participated in ACEF, including practitioners who are designing, implementing and financing clean technology projects and initiatives. With the rapidly declining cost of renewable energy sources and the digitalization efficiency in the energy sector, ADB believes ACEF to be an ideal platform for practitioners to meet and initiate innovation. Kopernik and WIPO GREEN identified 16 companies with over 24 technology needs across water, energy, agriculture, and air areas. Each of the technology seekers spoke about their technology needs at the event and discussed the solutions and adoption of relevant technologies. I Putu Wiraguna, founder of Five Pillars Foundation Indonesia, presented his organization’s technology needs to the matchmaking event audience consisting of private companies, social enterprises, government agencies, and financiers. Over 100 participants from 26 countries attended the matchmaking event ranging widely from Sweden to the Federated States of Micronesia. Participants represented private companies, social enterprises, government agencies, financiers, and NGOs. Based on a survey Kopernik and WIPO GREEN distributed, the participants rated the event an average of 4.1 out of 5. The survey also showed that each participant made an average four connections from the event. In addition, participants agreed that the event contributed to improving their knowledge and understanding of the processes, challenges, and opportunities surrounding the transfer of green technologies leading to a rating of 4.2 out of 5. Through this initiative, Kopernik and WIPO GREEN aim to cultivate success stories in technology transfer and diffusion to tackle today’s challenges through socially and environmentally responsible solutions. Kopernik is currently analyzing and compiling insights and recommendations based on the need identification phase as well as the matchmaking phase of the project, which will be published in the second half of 2018. WIPO GREEN conducted a webinar on Wednesday, July 11th as a follow up to the matchmaking event titled “Understanding Intellectual Property in Green Technology Innovation and Diffusion”. This webinar intends to deepen the understanding of the role of intellectual property in the development, commercialization, and adoption of innovative technologies. Please click on the link below to check out the video here.